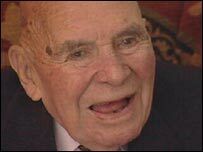 The last British serviceman to serve in both World War I and World War II has died aged 106. Captain Kenneth Cummins served in the Royal Navy in WWI and in the Merchant Navy in WWII. Until his death at home in Great Bedwyn in Wiltshire on 10 December, he was one of five WWI veterans living in the UK. Dennis Goodwin, chairman of the WWI Veterans' Association, said: "Any death of a veteran of WWI means the end of a unique and special generation." The four WWI veterans who survive him are: William Stone, 106, of Oxford; Henry Allingham, 110, from Sussex; Philip Mayne, 107, of Richmond, North Yorkshire; and Harry Patch, 108, from Somerset. In WWII, Mr Cummins survived the torpedoing of his ship, the Viceroy of India, which was owned by P&O but used by the military. In 1918 he witnessed nurses' bodies floating in the ocean after a Canadian hospital ship was illegally destroyed by the Germans. "Ken was one of the icons," said Mr Goodwin. "It was the likes of Ken and all the vets who survived WWI who put this country back on its feet and made Britain what it is today."